This is an impressive entry into the market by Düsenjäger that once built and painted bright yellow, will look great parked on the shelf that holds your 1950s and 60s US Navy Aircraft. Düsenjäger is a new name to me. 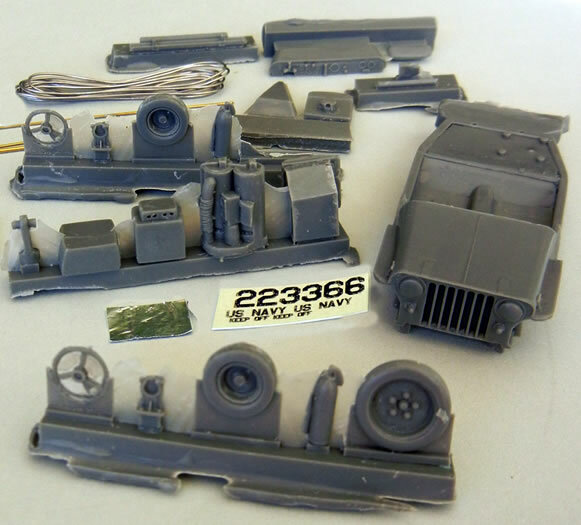 From what I can find out, it is a new company based in Germany and they produce limited run multimedia kits that are aimed at the “experienced” modeller. Kit 4801, a 1/48 scale NC-1A APU-Tug appears to be their debut into the market. 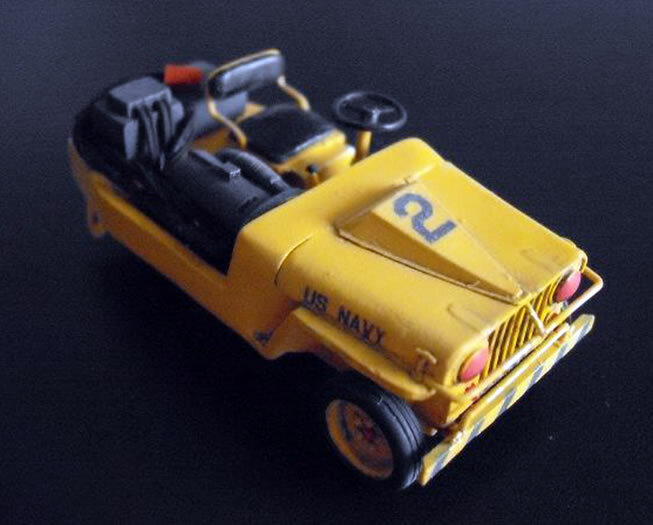 Looking like a cut down Willys jeep, the NC-1A APU-Tug was a mobile start unit that was used on the decks of US Navy carriers in the 1950s and 1960s. The kit comprises 18 grey resin parts, three lengths of brass rod, a small coil of copper wire, a small coil of solder, a small decal sheet, a small piece of aluminium foil, and an A-4 sized instruction sheet. The resin parts in my sample are all very well cast indeed. Examples of the detail included are that the driver’s seat exhibits creases and folds, and the wheels have their tyre inflation stems cast in place. Whilst there is a fair bit of flash on the parts it is not really an issue as clean-up is as easy as simply peeling it off. Importantly, I was not able to find a single pin hole in any of the parts, even during clean up phase of building the kit. One of the resin parts is actually a jig for bending the brass rod into the seat frame – nice! The instruction sheet is in the form of an A-4 sized page with printing on both sides. 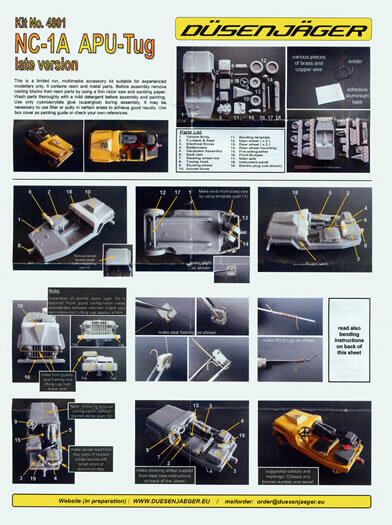 The front of the page shows images of the kits parts – along with a written inventory- the kit under construction and the completed kit as well. The rear of the page contains written instructions as well as a link to images of the one-to-one-scale NC1. The decal sheet is a small affair that carries a pair of US Navy titles, a pair of “keep off” stencils as well as a pair of 2s a pair of 3s and a pair of 6s’. The decals look to be Alps printed. Packaging is via a vac formed small plastic container. I take my hat off to whoever packed the kit as the container is very small indeed and there are a lot of parts to fit into it! Düsenjäger have a website at http://www.duesenjaeger.eu/ However, when you reach the page you are greeted with an image of the completed NC-1A and the words “website coming soon”. There is also an e-mail link - order@duesenjaeger.eu – so I am guessing that you need to e-mail them to either find out where you can buy the kit or if you need to purchase it direct from them. Thanks to Dusenjager for the review sample.